ROCKVILLE, Md., Oct. 25, 2018 /PRNewswire/ -- Choice Hotels International, Inc. (NYSE: CHH) has signed an agreement with Kiran "Kenny" Bhakta of KB Hotels, LLC, to develop the new Cambria Hotel Waco University Riverfront in Waco, Texas. 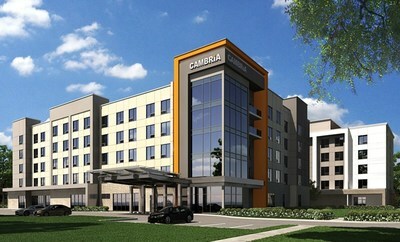 Slated to open in 2020, the four-story, 135-room upscale hotel will be one of several Cambria properties to join the brand's growing portfolio in the state, with hotels already open in Dallas, McAllen, Plano, and Southlake, and opening soon in Austin and Houston. Situated along the Brazos River at the corner of Martin Luther King Jr. Boulevard and Bridge Street, the new Cambria Hotel Waco University Riverfront is minutes from the heart of Waco, providing guests with easy access to the city's vibrant dining, arts and culture, and shopping scene. The hotel is conveniently located near Baylor University, the SpaceX testing facility, and the offices of Providence Health Center and L3 Technologies. Several popular leisure attractions are close by, including the Waco Mammoth National Monument, the Texas Sports Hall of Fame, and the acclaimed Magnolia Market at the Silos, home to HGTV Fixer Uppers hosts Joanna and Chip Gaines' retail store and bakery. "The Cambria Hotel Waco University Riverfront represents an important component of our continued growth throughout the Southwest and in markets with strong business and leisure demand. Waco, long anchored by academia and agriculture, is benefiting from a resurgence fueled by rising tourism and a growing technology sector, making it ideal for Cambria development," said Mark Shalala, vice president, franchise development, upscale brands, Choice Hotels. "The Cambria Hotels brand has experienced tremendous success in the Lone Star State and we look forward to working with KB Hotels to introduce another great hotel with top-notch amenities to travelers in Texas." The Cambria Hotel Waco University Riverfront will be developed by KB Hotels, LLC, an award-winning hotel development company located in central Texas. "With local businesses helping to attract more than 30,000 visitors per week, demand for lodging in Waco is at an all-time high. We know the Cambria Hotel Waco University Riverfront will be a welcome addition to the community and we are eager to bring the property to life with Choice Hotels. Guests will love the hotel's prime location and upscale amenities like the pool and wine room," said Kenny Bhakta, founder, president and CEO, KB Hotels, LLC. KB Hotels, LLC is an award-winning development and management company with two of the highest ranked hotels in Central Texas, including the international award-winning Hotel Indigo Waco-Baylor. KB Hotels is building three additional hotels in Waco, including the Holiday Inn Express Waco Riverfront, an Even hotel, and the Cambria Hotel Waco University Riverfront along the Brazos riverfront. KB Hotels is also currently building in Southern California and will be building two new full-service hotels in Fort Worth, Texas starting 2021. At KB Hotels, it is our desire to inspire not only our guests, but the communities we are a part of. That is why we will continue to partner with local non-profits in each new location and provide our guests with an opportunity to join us in giving back to the neighborhoods we call home.